Next-gen consoles? Bah! "PC Master Race?" Get out of town! VR?! Don't make me laugh! Everyone knows the hot thing in 2017 is the Sega Genesis/Master Drive system. And everyone who's anyone knows that THE hottest game to get is Paprium. It'll make you question everything you know about games, love, and that poster on your wall that gives you funny feelings. Ok, now that I've time warped back from 1992, hello. Yes, games development in the year 2017 has reached the point where developers are actually going so retro that they are making new games exclusively for old consoles. WaterMelon Games has finally revealed their latest title Paprium in a trailer that may be one of the best things I've watched all year. 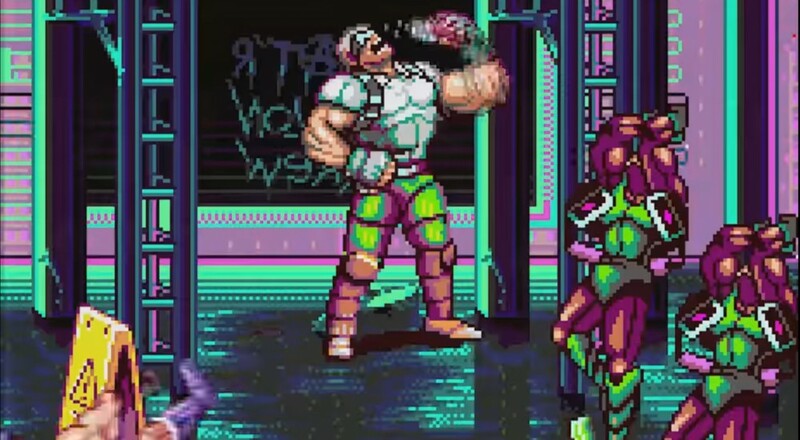 The game is a classic side-scrolling beat-em-up that supports two player local co-op, but there's a catch. You can only get Paprium for the Sega Genesis/Master Drive systems. No, really. According to the game's official website, the game cartridge will only work with "PAL and NTSC original Mega Drive / SEGA Genesis game system," and "after-market systems do not have the guts to run PAPRIUM." It also sounds like there are no plans to port it to PC or some other platform. So, yeah. If you've still got a working Mega Drive / Genesis system laying around (and $69), then you're in luck! If not, I guess hit up eBay or something? Page created in 1.0237 seconds.